A teacher is someone who see of us as unique persons and encourages our talents and strengths. A teacher is someone who looks beyond my face and sees inside my soul even with eyes in the back of her head (just like mom). A teacher is someone with a special touch, a smile, someone who takes time to listen to all sides and is fair, even when I mess up. A teacher is someone with a caring heart who respects and understands even when they don’t want to and even when I want him to only take my side. A teacher is someone who looks past bad choices to see the hurt and pain in others even when she has a tough day herself. A teacher is someone teaching all of me, not just certain parts of me. A teacher is someone building my confidence and raising my worth in life. A teacher makes a difference in my life, affects my family, and pushes me to my future! Bless you, LME staff, for the work of teaching and learning you do every single day! Happy National Teacher Day; Go Team Miller! 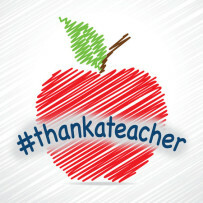 This entry was posted in Personal Reflections and tagged National Teacher Day, teachers, thanks. Bookmark the permalink.